MSI has now released the B350I PRO AC, a mini-ITX option for those looking to build a small form factor system featuring AMD’s Ryzen processors or a 7th generation Raven Ridge APUs. 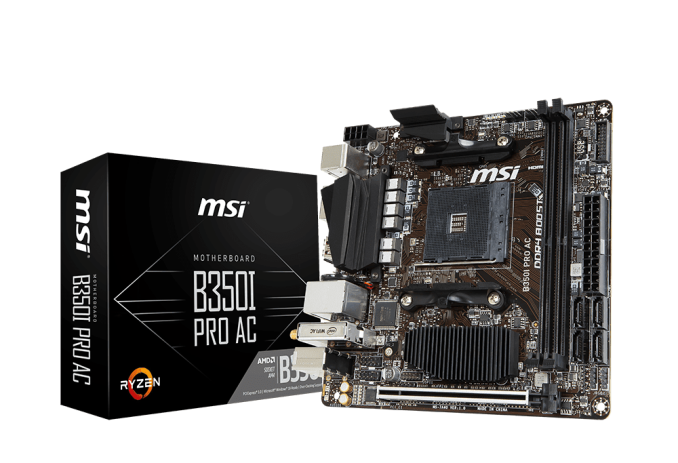 Deviating from their more recent AM4 offerings primarily marketed towards gamers, the B350I PRO AC has been designed to cater for all users including professionals and has a number of new features commonly seen on the bigger high-end boards. The MSI B350I PRO AC sports a formidable 9 phase power delivery design (6+2+1), using 'high efficiency' drivers and chokes - normally we would see this configuration on higher-end motherboards that would be promoted users looking to do a little bit of overclocking, so it is clear that MSI is going for stability here. Due to the size, a single PCIe 3.0 x16 slot features MSI’s Steel Armor to reinforce against damage from heavy graphics cards that might apply some torque to the slot. This Mini-ITX B350 has support for dual channel DDR4 memory with speeds of up to DDR4-3200 and with two memory slots being present, the B350I PRO AC can be installed with modules with a total maximum capacity of 32GB. The B350I PRO AC offers multiple storage solutions including four SATA 6Gb/s ports and a single M.2 slot that supports a PCIe 3.0 x4 or SATA drive. This board does support RAID 0, 1 and 10 arrays via the SATA 6Gb/s ports. 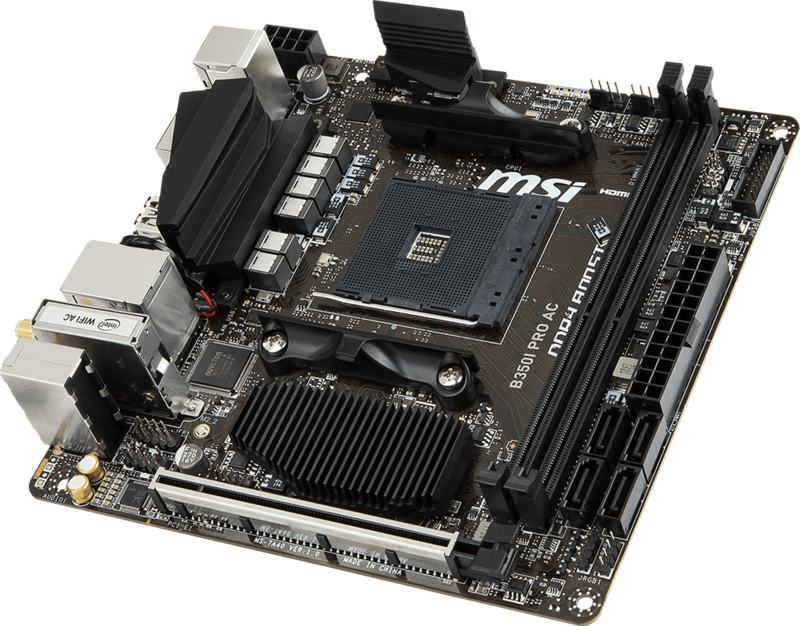 On the rear panel, the MSI B350I PRO AC has two USB 3.1 Gen 2 Type-A ports thanks to the inclusion of the ASMedia ASM3142 controller. Also included is a further two USB 3.1 Gen 1 ports, two USB 2.0 ports and a single PS/2 combo port for keyboards and mice. Audio wise, this model features a Realtek ALC887 codec with three 3.5mm audio jack inputs included on the rear panel. The single Gigabit LAN port is driven by the more budget Realtek 8111H Gigabit LAN controller and also included is an Intel dual band 3168 Wi-Fi module which has support for Wi-Fi 802.11ac, (2.4/5GHz), and this also includes Bluetooth 4.2 connectivity. Lastly, for users of AMD's Raven Ridge APUs, MSI has implanted a DisplayPort 1.2 and HDMI 1.4 port to make the most out of the onboard graphics. Pricing and availability are currently unavailable at the time of writing, but this will hopefully be revealed soon. Still no HDMI 2.0 for Raven Ridge? Specification Detail tab on MSI page has a footnote that says the video specs are "Only support when using a 7th Gen A-series/ Athlon™ processor." AMD "Raven Ridge" APU laptops like the HP Envy x360 are advertising DP 1.4. That is a claimed benefit of Raven Ridge over the Intel i7 models which implement DP 1.2a rates. There's already the GIGABYTE GA-AB350N-Gaming WIFI. In fact, I'm hoping to see a comparison once this hits shelves. Oh, and I see there's actually more: a Biostar 370-based one here: https://www.anandtech.com/show/11858/the-biostar-x... and mention of an ASrock board in the comments there, and perhaps more.